Very original "white" RENAULT R5 TURBO 2 type R8820 with nice and original beige velour interior. Equipped with the 1360 cc four cylinder in line engine (type 840-30) producing 162 bhp and attached to a 5 speed manual gearbox (type 369). 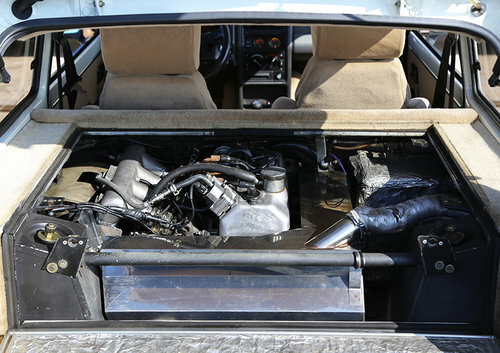 To increase output, the 1.4 liter engine received a Bosch K-Jetronic fuel injection, a transistorized ignition and a single Garrett T3 turbocharger with an air-to-air intercooler. Powering this 970 kg car from 0 to 100 km/h in 6.9 seconds and giving it a top speed of +- 200 km/h. 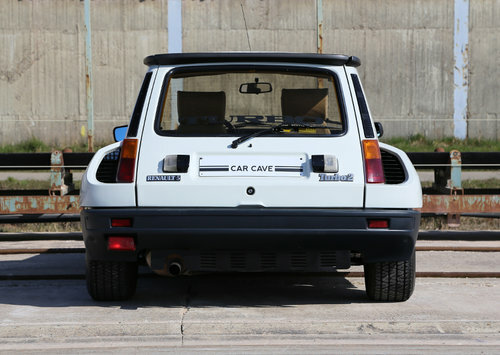 At the time of its launch it was the most powerful production French car with the turbocharged engine placed behind the driver in mid-body of the modified chassis.  The Turbo 2 is a high performance hatchback. 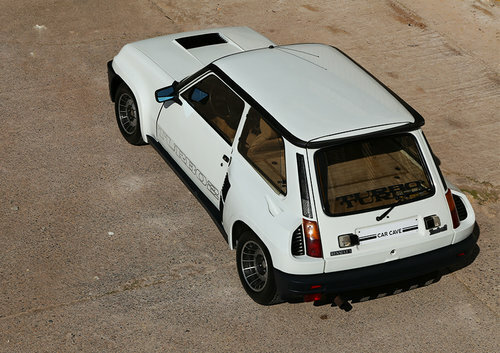 It was primarily designed for rallying, but was also sold in a street version. Alpine-Renault in Dieppe assembled the cars on the same production line as the Renault A310. Though it used a modified body from a standard R5, and was bached as a R5, the mechanics were radically different. The most obvious difference being rear-wheel drive and rear mid-engined instead of front wheel drive and front mounted engine. The turbo 2 was the less expensive car. The interior was straight out of the typical European R5 and usually beige. The body had steel door and steel roof instead of the light alloy parts on the Turbo 1. This particular car was originally supplied in France. The old French number plates is visible in the windows : 9955 VC 06 that means in the region of Nice. In 1990 it was imported into Spain and every since stayed in a beautiful Spanish collection. That explains the low mileage of the car. Only 56.500 km from new. And has the pop out rear windows, the original black roof spoilers and an original factory option " Tour de Corse front spoiler" with the big, round fog lights. The car has been serviced by our team and received new fuel pumps and fuel lines. Today the R5 turbo and turbo 2 retain a dedicated following and low mileage examples turn up on a somewhat regular basis. 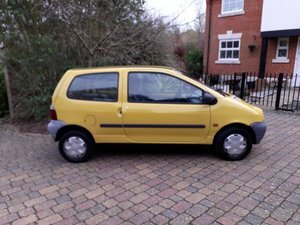 As a purpose built sports car, the Renault doesn't make a practical or comfortable daily driver, and is best thought of as a "special occasion" car. 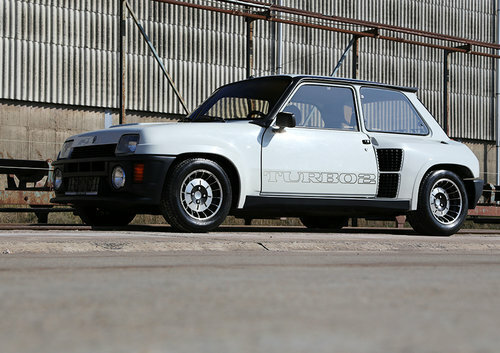 For those with a nostalgia for all things from the 80's and blessed with access to winding open roads (or better a nearby racetrack) The Renault R5 turbo variants offer a satisfying addition to any collection. 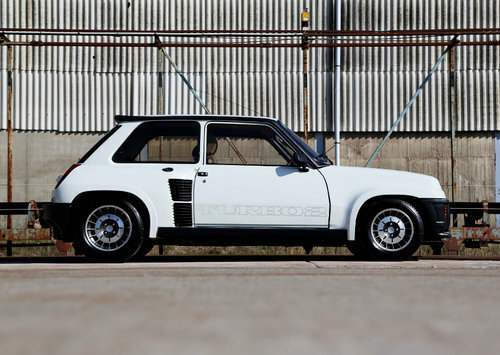 Relive your rally dreams of the 80's with this superb mid-engined Renault. With only little more than 3000 produced (and how much left ??) this is a very rare and interesting sports hatchback. Do not hesitate too long.